Water based electrical energy generation is nothing new. From waves crashing down onto the beach to long rivers rushing through a narrow channel, the power of moving water can serve as an abundant source of renewable energy. Hydrokinetic based technologies produce a clean and renewable energy source by harnessing the kinetic energy of a moving body of water. Hydrokinetics often refers to in-river power generation but it can also be use to describe ocean based tidal current technologies as well. Hydrokinetic Energy uses the force of moving water (current) to turn turbines placed directly in domestic rivers, estuaries, coastal waters or tidal flows, which in turn drive electrical generators that convert the kinetic energy of the moving water (hence its name “Hydrokinetic Energy”) into electrical energy. The generated electricity can then be changed to an appropriate voltage and sent along the utility grids transmission lines to consumers. The availability of the hydrokinetic generated power depends on the speed of the river, ocean, or tidal current which is expressed as a function of the density of the water multiplied by the speed of the water current cubed. As the need for reliable sources of energy production continues to increase, studies suggest that hydrokinetic energy projects based in rivers and oceans can one day supplement over ten percent of our energy needs. As a result, projects are well under way around the world to assess the potential of this seemingly limitless supply of water based energy. Unlike more traditional hydro power generating projects, hydrokinetic energy projects do not require large dams, impoundments of water or canals and diversions of the water. Instead, hydrokinetic projects produce electricity by harnessing the power of moving water in waves, river currents, and tidal channels. Hydrokinetic technologies can be classified based on the main ways that they harnesses the hydrokinetic energy and their location. Marine and ocean based hydrokinetic energy devices capture the energy contained in shoreline, near-shore and off-shore waves which includes attenuators, point absorbers, and oscillating water columns. Attenuators are floating segmented snake like structures like the Pelamis Wave Power device. The up and down motion of the waves generates energy at their segmented hinges, pressurizing a hydraulic piston which pumps oil through an hydraulic motor and which in turn drives an electrical generator producing power. Point absorbers are another ocean based technology similar to floating buoys anchored to the seabed as shown. Point absorbers may be fully or partially submerged and as they float, they absorb energy from all directions. The power take-off system may take a number of forms depending upon the absorbers design but generally they all collect the oceans energy using a pump, that rises and falls with the motion of the waves, compressing seawater which drives a hydraulic turbine. Oscillating water columns are shoreline based energy devices that operate by allowing waves to enter and exit through a partially submerged hollow chamber. Air trapped inside this chamber becomes pressurized by the constant rise and fall of the sea water within the structure. As the air becomes compressed it is forced into a wells turbine, producing electricity. Unlike wave energy devices that extract the energy directly from surface waves, tidal stream and tidal energy technologies harness energy from the tidal currents flowing below the waters surface. Large underwater turbine blades are driven by the moving sea water, causing the blades of the rotor to turn a generator. These underwater hydrokinetic turbines can extract more energy at lower velocities than wind turbines, because sea water is denser than air. In fact, hydrokinetic turbines have the potential to produce forty times more power than a similar sized wind turbine. In-river hydrokinetic turbines generally involve either horizontal or vertical-axis turbines based on the alignment of the rotor axis with respect to the water flow. Inland waterway and river hydrokinetic turbines operate under the influence of varying amounts of water flowing through a river which itself depends upon the amount of rainfall and mountain run-off water. River water is less dense than seawater as it is fresh water containing less dissolved salts and debris and therefore it has lower energy density. The ability of hydrokinetic energy to be installed in rivers and along the coastlines of major population areas allows for hydrokinetic energy devices to be easily connected to existing power utilities and infrastructure without having to send the generated energy across vast miles of underwater cables. Then a readily available hydrokinetic energy project could ensure that local communities would receive uninterrupted access to a clean, renewable energy source. Hydrokinetic Energy is also an attractive energy source because of how hydrokinetic projects do not contribute to greenhouse gas emissions and have very little effect on the local environment, depending upon the geography of a site. Also, hydrokinetic projects have less visual aesthetic impact to the surrounding environment than wind turbines as generally, most of the mechanical components of the various hydrokinetic devices are located underwater. However, hydrokinetic generators in tidal and non-tidal rivers can cause both positive or negative impacts on the marine environment. Unlike the intermittent nature of other types of renewable energy sources, the natural sources of hydrokinetic energy are generally predictable and unaffected by weather variability. The wave patterns for ocean based hydrokinetic systems can be accurately forecasted several days if not weeks in advance, and the oceans tides will always reoccur every twelve hours or so because they are connected to the moon’s gravitational pull. River currents, on the other hand, are known to fluctuate seasonally and are susceptible to wet and dry years, making it difficult to predict river levels and flow from year to year. Also, the siting of the hydrokinetic generating devices could become more stringent in river channels and inland waterways as the usable space is limited and river transportation may further constrain the usability of the sites. Marine and Hydrokinetic Energy is a great source of power but it still has many advantages and disadvantages to overcome. The main advantages are that the resources are renewable and produce less or no pollution. The main disadvantages are that river based energy systems do not provide a constant enough flow of energy while ocean based energy systems can have undesirable affects on mammals, fish migration and the general marine eco-system. But hydrokinetic energy production does represent one of the cleanest and efficient energy platforms available to us today so its development will continue to grow. For more information about “Hydrokinetic Energy” and how to generate electricity using the power of the sea, or obtain more marine and hydrokinetic energy facts about the various river and marine energy systems available, or to just explore the advantages and disadvantages of ocean power in general, then Click here to order your copy from Amazon today about hydrokinetic and marine energy technologies, giving us power from moving water. Wave energy is rapidly emerging as one of the best means of harnessing energy from the ocean. Wave Energy also known as Ocean Wave Energy, is another type of ocean based renewable energy source that uses the power of the waves to generate electricity. Unlike tidal energy which uses the ebb and flow of the tides, wave energy uses the vertical movement of the surface water that produce tidal waves. 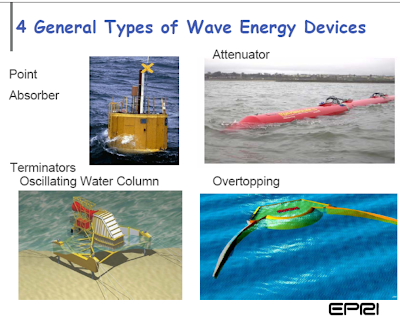 Wave power converts the periodic up-and-down movement of the oceans waves into electricity by placing equipment on the surface of the oceans that captures the energy produced by the wave movement and converts this mechanical energy into electrical power. 1. Point Absorbers – which are tethered to the ocean floor. 2. Wave Attenuators – which are long horizontal semi-submerged snake-like devices. 3. Oscillating Water Column – which converts wave energy into air pressure. 4. Overtopping Devices – where the sea waves are driven up the ramp filling-up a small tidal reservoir.